This is our 4th year at the Stars Hotel and were back again in September! Milla and Kostas provided us with a warm welcome as always even if we did arrive early in the morning! Our room, as always, was kept clean and we were provided fresh towels as required. Rooms are basic, but comfortable and requests for items are always met where possible. All areas are kept clean and tidy. Food was delicious, vegetables grown in their own garden. Requests for meals were taken graciously and provided if possible. Milla and Kostas are lovely people and have always been courteous to us. They are a font of knowledge and are happy to suggest places to visit and things to do and see. The hotels is located a short walk from the hotel and town is 10-15 minutes away. Beach is beautiful and clean. The entertainment is light, friendly and funny. Not every night is jammed pack with things to do, so you have the freedom of going of site and not feel that you're missing anything. This was a really horrible place to be. The facilities did not support basic self-catering, no kettle or toaster let alone the sight of one clean pan. The food available at the bar was really greasy and a friend developed stomach problems after eating here so we never ate there again. The location was out of the way way from beach but it was walkable. The owner was a very rude, ignorant and arrogant man and when you try to talk to him when he has a problem with you he can become aggressive and not listen. He is very rude when you don't buy food and drink from his bar especially - very offensive man. The pool is very very small and uninviting. The saving grace of this holiday was getting out away from Stars. Also from talking to local people who live there he has a bad reputation locally also. The appartments are situated in a peaceful location at the edge of St Georges. From the minute you get off the bus you are made to feel very welcome by Kostas and Mila. The accomidation is good and the meals provided by Mila are of a good quality. The pool area is always clean and tidy with a decent sized pool. The most important thing for me is that you always feel safe at Stars as Kostas puts his guest's feeling above everything else. We have been to Stars twice and the amount of return business they receive goes to show that what they offer at the appartments is good value for money. The proof is in the eating so book your holiday and judge for yourselves how good Stars is. Thank you Kostas and Mila for yet another fantastic holiday. We stayed at STARS Studios and it was an absolute disgrace! The entertainment was pathetic! Quiz night seemed extremely pathetic and boring! if you are going to stay here, I would reconsider, but if you do, it is likely that you will not spend too much time here because it is awful! We have been going to Stars for 10 years now and have no complaints whatsoever. From the very first year Kosta and Mila and all the family have been friendly and helpful. Evenlast year my father being ill they went to get medication for him from Corfu town that is how helpful they all are. All you new people going you also have to make an effort to get to know them once you do you will know what I mean. All food is freshly cooked, not frozen and all wonderfully prepared, with home grown veg, fruits and salad. Rooms are always cleaned as they state and clean towels provided, pool area is great. So what if its a 5 minute walk to the beach this is good exercise and it is stated in the brochures, so read them. Anyway sorry if some people feel, but you have not given Stars a chance once you do you will feel differently. All of our Party - big cheers for Kosta, Mila and family and keep the Mythos cool for next year. What a fantastic holiday this was for me. Peaceful, relaxing & very comfortable. It ticked all the boxes for me. I was taken in by the location...just off the main resort. It had everything I needed, sunbeds, a lovely pool (perfect for cooling off). The accommodation was very clean, and well maintained. All you need really for a holiday. Somewhere to shower, sleep...dress...make coffee in the morning. A nice balcony area if you wanted to relax on your own. The Manager Kostas and his wife Mela were very attentive. Nothing was too much trouble for them to do, and they made me feel like I had known them all my life. The food at STARS was just superb and of a very good quality. I did not have to go anywhere else as they catered for all my needs. From local specialties like Stifado and Pastitsio which were all delicious to the light meals like Pitta Gyros. All cooked to order and all presented very well on the plate, with a lot of care. And if there was anything you particularly wanted you could feel free to ask and they would offer to do it for you. The night times were very entertaining with quizzes, bingo, karaoke. Kostas has a very good sense of humor and made me laugh every night. Kostas is also very friendly but very professional in what he does and how he conducts himself . He is always aware of the safety and comfort of his guests. He is not overbearing in anyway. You know he is there if there is anything you need but he is not in-your-face and gives you space to just enjoy your holiday. It is somewhere I would without question recommend to anyone. So much so that I will be going back to STARS next year. This is the 5th time we have stayed at Stars. We've been on our own and with our 2 young children and we love it there. 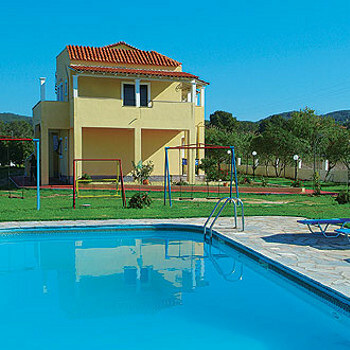 The rooms are as you would find in any 2 star greek hotel and are clean and tidy. Rooms are cleaned every other day and towels are provided for the room which really saves room in your suitcase. There is a fridge and a 2 ring burner which are the self catering facilities we have found in every greek hotel we've ever been to. Mila and Kostas are lovely, friendly people and the hotel is family run - there isn't anything they wouldn't do for you if you just ask - they have on occassion lent us their own household iron and ironing board when we've asked! As a family hotel we have found that safety is paramount and Mila and Kostas show a true interest in the saftey of children in and around the pool area which is not something you find in many small hotels. If you have young children and want a hotel where you can be sure that they will be safe and where they will get a good nights sleep away from the noise of the resorts main street and where you can get homecooked, good value food then this is a good place to stay! stayed at the stars studios in st george south, corfu for the fifth time. We continuly stay there because of the safe location of the apartments being down their own drive at the edge of the village, the very friendly welcome from the owners Mila and Kostas and the fact that they cannot do enough for you to make your holiday an extra special stay. The apartments are cleaned and bedding changed every other day and towels are also provided saving you weight in your luggage. Meals can be ordered at the pool bar and eaten in the shaded restaurant area. These are all home cooking by Mila who is an excellant cook. The choice of meals is unbelievable and are available from breakfast all day to late evening. Sitting around the bar on an evening chatting to Kostas and the other guests, listening to his story;s and joining in the quiz nights is one of our favourite pastimes. We have recommended Stars to all our friends and family and some of them have stayed there as well. We hope to be visiting again next year and can't wait to be in our home from home.